Ardlinnhe offers Double and Twin bedded rooms, all with en suite shower facilities and fresh modern décor throughout, with complimentary soap and toiletries. Our bedrooms are stylishly furnished with superior quality bed linen. All our rooms have tea and coffee making facilities, flat screen TV/DVD with Freeview, hairdryers and an iron/ironing board are available on request. In our hallway we have a selection local interest DVD's to be viewed at your leisure. We offer a selection of leaflets covering many local attractions, there is also some sample menus from local restaurants. Free Wi-Fi throughout. This room has views from Velux windows across Loch Linnhe to the Ardgour Hills, it is a cosy room with two deluxe single divan beds. 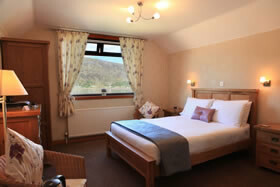 This spacious room has magnificent views of Loch Linnhe and the Ardgour hills. This room also has a large comfortable double bed. This Room looks on to the rear of the property and has all the same facilities as the other rooms.